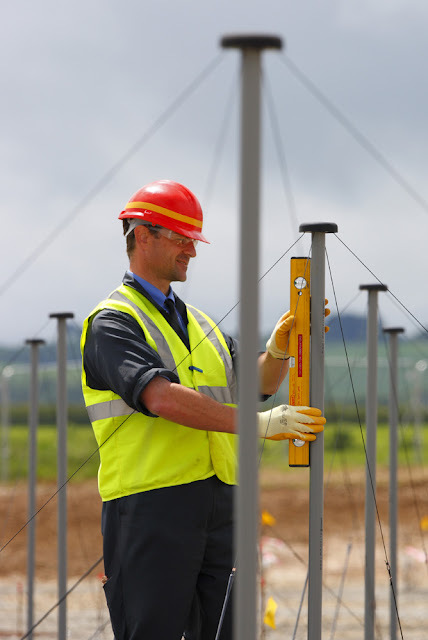 Yesterday, ASTRON and the Polish LOFAR consortium POLFAR signed a contract for the construction of three new antenna stations for the International LOFAR Telescope (ILT) in the north, west and south of Poland. The new LOFAR stations will be located in Łazy (in southern Poland, operated by the Jagiellonian University in Krakow), Bałdy (in northern Poland, operated by the University of Warmia and Mazury in Olsztyn), and Borówiec (in western Poland, operated by the Space Research Centre of the Polish Academy of Sciences). The formal agreement between the POLFAR consortium and ASTRON now marks the start of the preparations for the roll-out of these new stations, which are expected to be operational in 2015. These stations will add to the existing International LOFAR Telescope stations: 38 stations in the Netherlands, six in Germany, and one each in France and Sweden, and our own Chilbolton station. Connecting the three new ‘POLFAR’ stations will add valuable extra sensitivity to the array, and in particular when combined with Chilbolton the Polish stations give ‘baselines’ of up to 1550 km in the array, making the ILT a much more capable instrument for high resolution imaging of detailed structues. This image below shows the updated station distribution of the ILT. 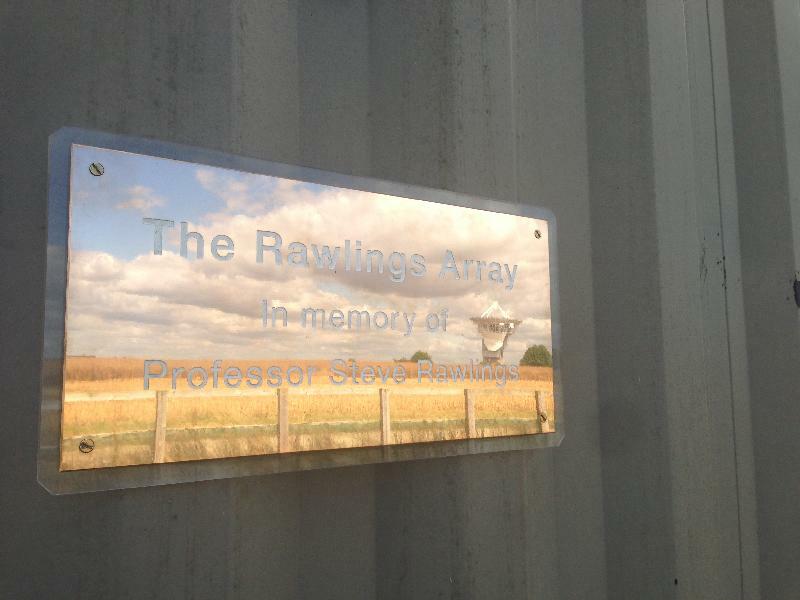 On Tuesday 27th August, a dedication ceremony was held at Chilbolton to rename the LOFAR-UK Chilbolton station as "The Rawlings Array", in tribute to Professor Steven Rawlings. 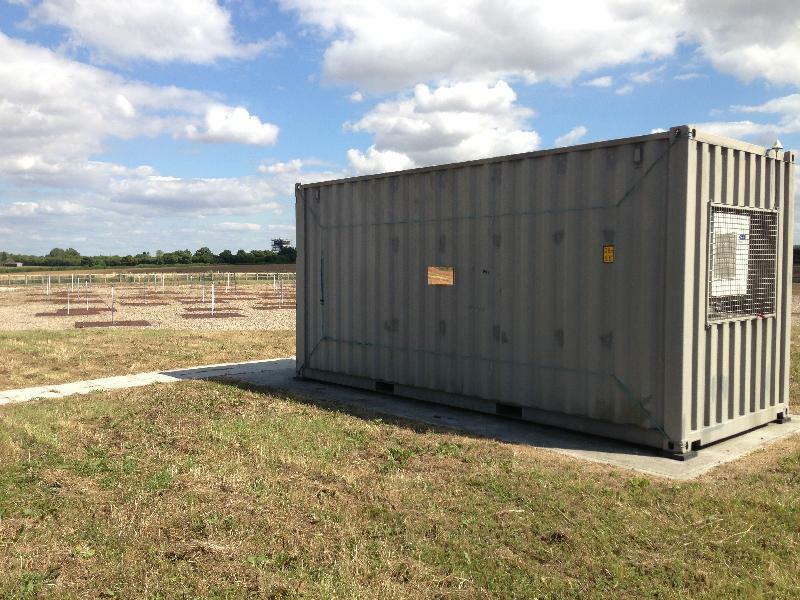 Professor Rawlings was instrumental in establishing the LOFAR-UK consortium, and in the decision to site the UK station at Chilbolton. Before his tragic death in January 2012, Professor Rawlings worked at the University of Oxford, where he played a leading role in both UK Radio Astronomy and the development of the international Square Kilometer Array project. The dedication ceremony was attended by members of his family, and members of the LOFAR-UK and international LOFAR communities. The LOFAR overview paper is now in press at Astronomy and Astrophysics. You can read all about it in this ASTRON press release, and download the paper itself from the arxiv:1305:3550. The International LOFAR Telescope is a next-generation software-driven low-frequency radio interferometer, which is opening up one of the few relatively unexplored windows in the electromagnetic spectrum, between 30 and 240 MHz. After an extended commissioning period, December 2012 saw the start of Cycle-0 science observations. These observations cover a very broad range of astrophysics, from cosmology to solar system studies, including the Epoch of Re-ionisation, pulsars, transient/variable sources, wide and deep surveys, cosmic rays, the origin of magnetic fields, and studies of the Sun and space weather. This parallel session will showcase the early science results from LOFAR Cycle-0 observing, as well as highlighting the current scientific and technical capabilities of the array, and forthcoming opportunities. Hope to see you in St. Andrews! A team of astronomers led by ASTRON astronomer Dr. George Heald has discovered a previously unknown gigantic radio galaxy, using initial images from a new, ongoing all-sky radio survey. The galaxy was found using the powerful International LOFAR Telescope (ILT), built and designed by ASTRON. The team is currently performing LOFAR's first all-sky imaging survey, the Multi-frequency Snapshot Sky Survey (MSSS). While browsing the first set of MSSS images, Dr. Heald identified a new source the size of the full moon projected on the sky. The radio emission is associated with material ejected from one member of an interacting galaxy triplet system tens to hundreds of millions of years ago. The physical extent of the material is much larger than the galaxy system itself, extending millions of light years across intergalactic space. The MSSS survey is still ongoing, and is poised to discover many new sources like this one. from Sloan Digital Sky Survey). The image is about 2 Mpc across. The new galaxy is a member of a class of objects called Giant Radio Galaxies (GRGs). GRGs are a type of radio galaxy with extremely large physical size, suggesting that they are either very powerful or very old. LOFAR is an effective tool to find new GRGs like this one because of its extreme sensitivity to such large objects, combined with its operation at low frequencies that are well suited to observing old sources. The center of the new GRG is associated with one member of a galaxy triplet known as UGC 09555. The central galaxy is located at a redshift of z=0.054536, or 750 million light years from Earth. The central radio source was previously known and has a flat radio spectrum, typical of giant radio galaxies. LOFAR's MSSS survey is a concerted effort to image the entire northern sky at very low radio frequencies, between 30 and 160 MHz (wavelengths from 2m to 10m). The primary aim of the survey is to perform an initial shallow scan of the sky, in order to create an all-sky model that will support the calibration of much deeper observations. It is comparable in sensitivity and angular resolution to previous surveys with ‘classical' radio telescopes like the Very Large Array (VLA) in the USA, ASTRON's Westerbork Synthesis Radio Telescope (WSRT), and the Giant Metrewave Radio Telescope (GMRT) in India. MSSS is unique in that it operates at substantially lower frequencies, and is therefore poised to uncover new sources that were missed by previous surveys. Its broad bandwidth coverage is also novel in all-sky radio surveys, and will be used to provide additional information about the detected objects. The international team of astronomers that is performing the MSSS survey is made up of about fifty members from various institutes, mostly in the Netherlands, Germany, the UK, Poland, France and Italy. Femke Boekhorst, PR & Communication. E-mail: boekhorst@astron.nl. Phone: +31 521 595 204. Dr. George Heald, astronomer. E-mail: heald@astron.nl. Phone: +31 521 595 100. LOFAR-UK would like to say a public thank you and goodbye to Derek McKay-Bukowski, who will cease his duties as the LOFAR Station Manager for UK608 (Chilbolton) at the end of March. Derek has been an integral part of LOFAR-UK through construction to ongoing operations, including the weeks on end without breaks when he slept in a small room at Chilbolton! We are all convinced that the LOFAR-UK station would not be the success it is without his dedication and attention to detail. Derek's flat-pack-station presentation at INTECH for the LOFAR-UK opening (which you can watch here) will long be remembered, as will his entertaining health and safety briefings. 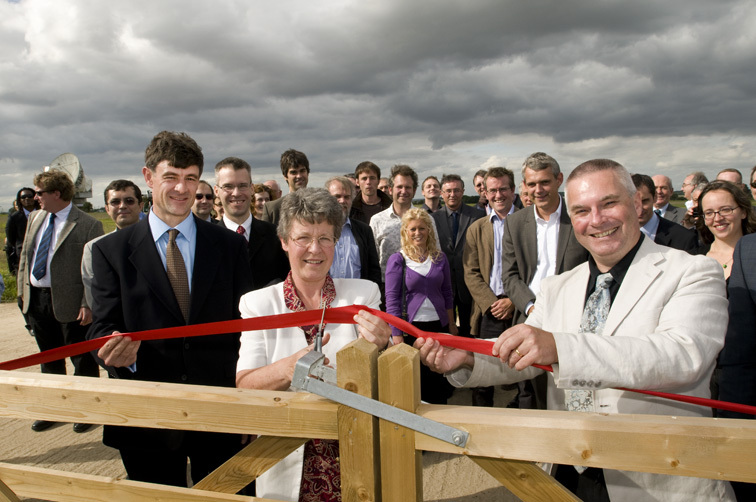 Derek (left) assisting Dame Jocelyn Bell Burnell at the official opening of UK608 in September 2010. 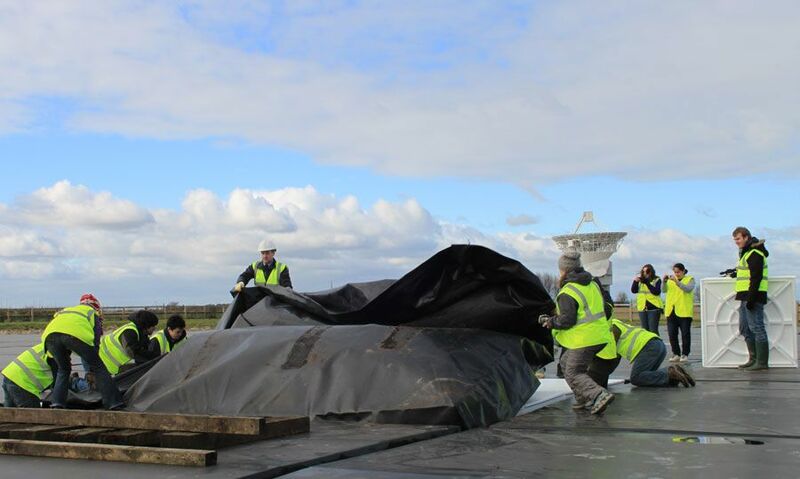 We must also mention Derek's contributions to LOFAR-UK in the early part of 2012. Derek went well beyond the call of duty when storms caused damage to some of the tiles and LBAs and his rapid intervention prevented this freak event from turning into a much more costly repair. Derek (centre in white hat) directing volunteers helping with repairs to an HBA tile in Febuary 2012. Image credit: STFC. It is with real sadness that we must say goodbye to Derek from the LOFAR-UK, and we him all the best in his future work with the KAIRA project in Finland. ASTRON is announcing the next LOFAR science meeting in Dalfsen, to be held next week (19-20th March). This is a great opportunity to bring more attention to the science results already coming out of LOFAR, and the fact that full operations are now happening. 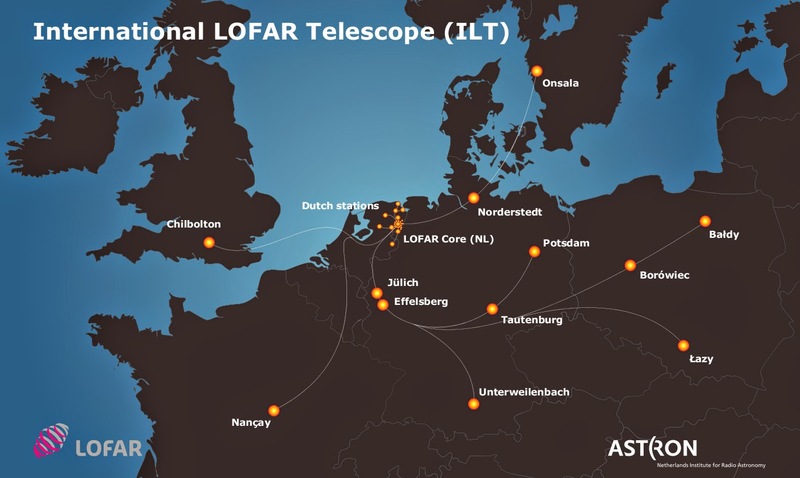 On Tuesday 19 and Wednesday 20 March, one hundred astronomers from all over the world will travel to the town of Dalfsen in the Netherlands for a 2-day workshop about the International LOFAR Telescope (ILT), designed and built by ASTRON. Now that the first fully operational observing cycle has started and the telescope is open to the whole astronomical community, LOFAR is officially open for business. The LOFAR telescope owes its strength to revolutionary new techniques and software for the processing of unprecedented large data streams from an extensive network of relatively simple radio receivers, concentrated in the north-east of the Netherlands and spread over Germany, France, the UK and Sweden. Eighteen months ago, during the commissioning and test phase of LOFAR, the first LOFAR science workshop was held, also in Dalfsen. Since then, new antenna stations have been added to the array and the sensitivity of the telescope has improved, as well as the processing software. Besides this, the first appealing scientific results have already been published in different renowned scientific journals. During the workshop in March, builders and users of the telescope, as well as owners of the different international antenna stations, can exchange science results and technical ideas and deepen the collaboration to get the most out of the LOFAR telescope at both the national and international level. Femke Boekhorst, PR & Communication, ASTRON: +31 521 595 204 and +31 6 21 23 42 43. E-mail: boekhorst@astron.nl.